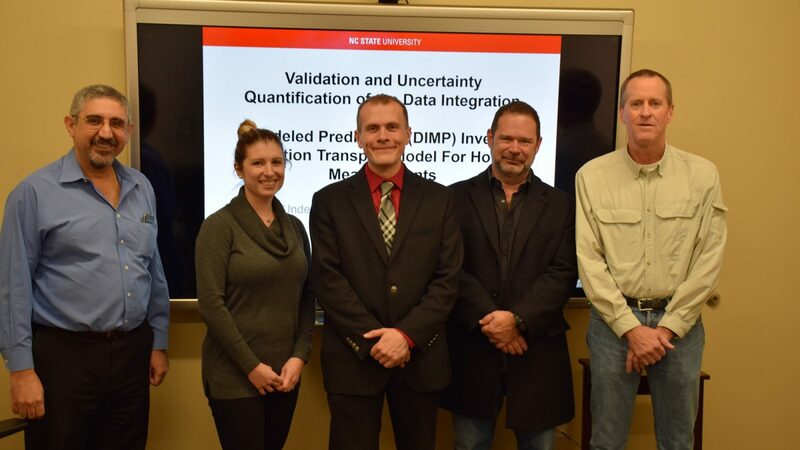 On October 18, Noel Nelson successfully defended his PhD dissertation,Validation and Uncertainty Quantification of the Data Integration with Modeled Predictions (DIMP) Inverse Radiation Transport Model For Holdup Measurements. Noel’s committee consisted of his co-advisors, John Mattingly and Yousry Azmy, and members, Louise Worrall and Ralph Smith. The original work performed by Hykes  validated the Data Integration with Modeled Pre-dictions (DIMP) inverse particle transport method for Cs-137 and Co-60 point and line sources. The original source predictions were fairly accurate with a few minor limitations: source solutions were often placed within the walls of the room in cells adjacent to the true source location and the search space needed to be reduced for DIMP to converge. These limitations were suspected to arise from the low intensity of the source strengths and the large average intervening distances between detectors and sources. This work sought to explore this assumption through stronger, realistic simulated holdup source measurements in a laboratory setting, and by improving the DIMP models. Radioactive source holdup is the intended application, which involves nuclear material deposits that build up in processing equipment at nuclear facilities. Currently, the Generalized Geometry Holdup (GGH) method is often employed in several nuclear facilities to measure holdup. GGH is rea-sonable at quantifying amounts of material present and the approximate source distribution, but it requires a lot of initial measurements and planning to locate radioactive sources. The DIMP method takes an alternative approach of predicting radiation source locations, distributions, and strengths purely through grids of passive detector response measurements in a facility. The original DIMP optimization algorithm was improved by incorporating a Basin-Hopping global search algorithm in addition to the original Quasi-Newton line search algorithm. In global DIMP search iterations were added to randomly shake the optimizer out of local chi-squared minima wells and better explore the cost function space. First, a numerical convergence study was performed in order to determine the stability of the original local DIMP algorithm and the sensitive input parameters within DIMP. DIMP proved to be conditionally stable when detectors were not placed overly close to the source of interest. Sensitive parameters included the detector response function (DRF) and the detector location. Also, a study was performed using unshielded (bare) detector responses only on Hykes’ Cs-137 point source, which is advantageous for higher detector efficiencies, simpler DRF models, and full 4π directional sensitivity to sources. Unfortunately, neither local nor global DIMP were able to accurately locate the source leading to the conjecture that it is more difficult to locate sources against boundaries and corners due to limited measurement angles and directions. Next, three vali-dation experiments were performed, compared to a current GGH based system, and analyzed using DIMP source prediction methods: a Cs-137 button source, a highly enriched uranium (HEU) metal calibration disk source, and a long line of HEU oxide line sources taped end to end. The original local DIMP Cs-137 button source prediction results were accurate in source location and strength but required similar search space reductions as Hykes’s original work . Global DIMP determined the correct solution without search space reduction. The HEU validations revealed a discrepancy between the measured detector responses and the DENOVO (the transport solver employed by DIMP) calculated detector responses using the true source input parameters. The measured detector response values were compared tol MCNP models and simple analytical source approximations of the actual experimental configuration, and the modeled and analytical values were in reasonable agreement. This led to the conclusion that either an unknown source was measured or equipment malfunction occurred during the experimental campaign. To facilitate completion of this project, synthetic data calculated by MCNP tallies was used for DIMP verification to further compare local to global DIMP performance. Similar results were obtained with the HEU synthetic data as with the Cs-137 validation. Global DIMP again was able to avoid search space reduction requirements, and both DIMP algorithms were able to locate the source with an acceptable underestimation of source strength (due to differences between DENOVO cubic source cell representations and the actual source geometry). However, both DIMP algorithms suffered from alternative solutions in the HEU line source case, which again used unshielded only detector response data. DIMP often placed weaker sources in cells a small distance away from the true location but outside of the steel pipe enclosure. In the presence of noisy detector responses, DIMP is unable to distinguish between the true strong source that is attenuated by the pipe and a weaker unattenuated source that sits outside the pipe closer to the detectors. It was surmised that this alternative solution comes from DIMP’s use of the uncollided detector peak response. Use of the collided response (Compton Continuum) with a more sophisticated DRF in future versions of DIMP might eliminate at least some of the alternate solutions. Furthermore, DIMP’s uncertainty in attenuated and unattenuated source determination may have further compounded noisey responses in the unshielded Hykes’ case study. Finally, a sensitivity study based on randomization of detector locations in sets of 7,15, and 24 locations using realizations of either 10 (global DIMP) or 100 (local DIMP), since global DIMP runs 10 local search iterations per run. The results showed some improvement in global DIMP over the local version in minimizing weak solutions far away from the true source location, but increased source strength errors. Source strength errors were common to both DIMP methods, and sources were often buried in the wall similar to Hykes’s original results. This result further illustrates DIMP’s current inability to distinguish between attenuated and unattenuated sources.